.:. 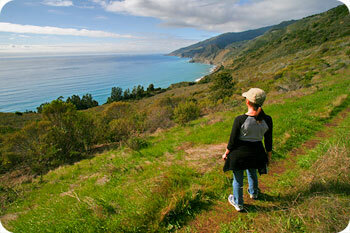 Hiking in Big Sur - Vicente Flat Trail (Vincente) .:. Note: Since this was written, the park service has replaced the trail head sign with a new one with the correct spelling of "Vicente". The first thing you'll notice as you stand at the trailhead next to Highway 1 is that the sign (pictured at right) spells the name "Vincente" with an extra "n". Yet, according to Monterey County Place Names (and most other references), the trail and turnaround area were named after Vicente Avila who had kept some stock animals here and had a small cabin at Vicente Flat. We'll spell it Vicente. Facing the "Vincente" sign, the trail heads straight up to your left. Some of the best ocean views can be had within the first 2 miles on this hike, so if you're staying across the road at the Kirk Creek Campground, or briefly visiting the area, try walking just the first few switchbacks up to 1000'. The first couple miles skirt along the side of the mountains overlooking the ocean, and alternate between stretches of dense coastal brush and more open grassy areas. The rocky trail is a little rough in spots, but passable all the way through. As you head north and up along the coast, you'll weave in and out of several pleasant side canyons which offer shade on warmer days. At one point, there is a solitary pointy rock several feet long sticking out of the hill right next to the trail that is pretty hard to miss. It looks like it dropped from the sky and stuck in the ground like an arrowhead. At about 2.8 miles, the trail starts hooking northeast above Hare Creek and you'll begin to catch wonderful views of Cone Peak and the surrounding mountains. The number of trees increases dramatically as you head up the canyon, and you'll thread several redwood groves, some exhibiting recent charring from the 1999 Kirk Complex Fires. Just shy of the 3.5 mile mark, Espinosa Camp will appear on the left, a few yards down from the trail. The camp, named for Louis Espinosa who homesteaded here in the late 1890s, has a fire pit, tent area, and partial view of the ocean through the trees. Another quarter mile up the trail is a year round creek. The trail levels out as you run along the canyon for a couple miles before descending to Vicente Flat along an exposed section of the path. The views of Cone Peak and surrounding hills and canyons are stunning along here. Cone Peak rises to 5,155 feet only three miles from the ocean, and the canyon below it is one of the deepest in the country. As you head down for your final approach to Vicente Flat, you'll cross Hare Creek and see a sign for the Stone Ridge Trail which goes off to the left. Go right and into Vicente Flat where you'll find a large grassy meadow along with huge redwoods and multiple campsites. This is our turnaround spot and you'll likely make it back in much less time than it took to get here. If you travel at a steady clip, 3.5-4 hours should get you to the flat, and 3 hours should get you back. Bring plenty of water. Just across from the trailhead is the Kirk Creek Campground where you can probably find an empty picnic table and also access to the coast past the eucalyptus grove. 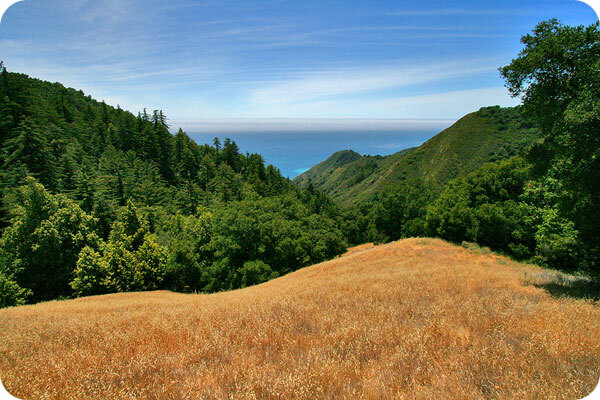 A popular alternative for hiking the Vicente Flat Trail is to start at the top along Cone Peak Road and work your way down through Vicente Flat and out to the coast at Kirk Creek Campground. This one way route is 7.5 miles from top to bottom and can be a less strenuous way to go, with relatively little uphill climbing. Make sure to have a car waiting at the bottom to take you back up to get your car at the top. The starting point for this version of the hike is from Cone Peak Road (also known as Central Coast Ridge Road). To get there, go up Nacimiento-Fergusson Road 7.1 miles, turn left onto graded Cone Peak Road and look for the pullout and trailhead on the left or west side at 3.7 miles. The road is generally impassable in wet weather. The Vicente Flat Trail starts from the inland, eastern side of Highway 1 just opposite Kirk Creek Campground (which also has restrooms). Look for the trailhead sign (with the misspelling "Vincente") near the shoulder of the eastern side of the highway, just a few feet north of the Kirk Creek Campground signage. You can park along either side of Highway 1 in the pullouts around the trailhead. The Vicente Flat Trailhead sign is just 9 miles north of Gorda, or 35.5 miles north of the Hearst Castle turnoff. Travelling south on Highway 1, the Vicente Flat Trailhead sign is 4 miles south of Lucia or 28.1 miles south of the entrance to Pfeiffer Big Sur State Park.